So the long drive we took on Wednesday to bond the bunnies has already been forgotten ... I had a feeling it might since Rex is still living in our bath and therefore they weren't "exposed" to each other for the whole night & day yesterday while we were at work again. Such a pity. But the new hutch-cage should be arriving later today - I can NOT wait! Once it's there Rex will move outside and we'll start swapping their hutches each night, getting them used to each other's smells. And then next Friday (the last public holiday for a while - boo!) we'll do another bonding drive and hopefully move them all into the big hutch. Would be doing it a little sooner if we weren't going to be away this weekend, but anyhoo. On the plus side Rex is such a little sweetie and has become a very, very friendly little dude :) I think it's all the time spent bonding with Varen & I and not with other boons yet. Last night J9-double0blonde came over and we all went out for dinner at the Throbbing Strawberry in Douglasdale. The restaurant was very cool, and so was their food :) Wish I'd had space for dessert! I started with their Duck Spring Rolls and had their Martini Sole for mains. Yum. It was the fourth attempt to use my Deals on Meals card. It almost didn't work ... When we tried to pay the manager came out to say that it was only valid for main meals up to R75, our cheapest was R79. I was under the impression that we'd still have the R75 deducted from our meal, and luckily they let us have it ... because after checking this morning, that is what the Deals on Meals website says: "For example if the discount limit is R60, and the cheaper of your 2 main meals costs less then R60, that main meal will be free. If it costs more then R60, then a maximum of R60 will be deducted from your bill." Still, we had a lovely evening with a little too much wine :) I got my birthday pressies from J9 & Squeak and I was spoilt :) I think J9 was a little nervous cause she knows I'm terribly fussy ... but she got me the most awesome gift! 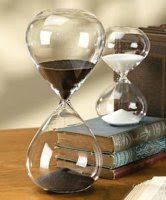 I got an hourglass. Okay, so I'm sure that just sounds bizarre, but it's lovely. It's about 15cm high and just plain blown-glass. It's got white sand and the closest picture I could find online was this one. But mine is a bit more "bulby" :) I will try to remember to take a photo on the weekend. Here's hoping the maid doesn't break it! (I left it packed away in it's box today, just in case!). And that's all folks :) Have a fantabulous long weekend ... next time I'll write I'll officially be 29. Sheesh. Happy, happy birthday long weekend weekend! I wish I had known Throbbbing Starwberry was a Deals on Meals restaurant when we ate there last week. I had a super yummy bacon, brie and strawberry foccaccia (sp?)... Yum. I do hope your birthday weekend was WONderful, and that the boon bonding will go well!